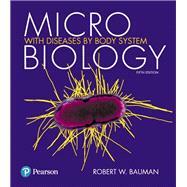 by Bauman, Robert W., Ph.D. Note: You are purchasing a standalone product; Mastering™ Microbiology does not come packaged with this content. Students, if interested in purchasing this title with Mastering Microbiology, ask your instructor for the correct package ISBN and Course ID. Instructors, contact your Pearson representative for more information. TODD P. PRIMM (contributor) is a Professor at Sam Houston State University, where he teaches pre-nursing and general microbiology. He also serves as Director of the Professional and Academic Center for Excellence, which focuses on improving teaching and learning on campus. In 2010, he was Distinguished Alumnus of the Graduate School of Biomedical Sciences of Baylor College of Medicine, where he earned a Ph.D. in Biochemistry. He received a B.S. from Texas A&M University. He is very active in the American Society for Microbiology and received the Texas Branch 2015 Faculty Teaching Award. He was chair of the organizing committee for the 2013 ASM Conference for Undergraduate Educators, participated in the 2012 Research Residency of the ASM/NSF Biology Scholars Program, and currently serves on the editorial board for the Journal of Microbiology and Biology Education. He is also an affiliate staff member with the international organization Cru. He loves teaching and mentoring students and spending time with his wonderful wife of 25 years and their five children. CECILY D. COSBY is nationally certified as both a family nurse practitioner and physician assistant. She is a professor of nursing, currently teaching at Samuel Merritt University in Oakland, California, and has been in clinical practice since 1980. She received her Ph.D. and M.S. from the University of California, San Francisco; her BSN from California State University, Long Beach; and her P.A. certificate from the Stanford Primary Care program. She is the Director of Samuel Merritt University’s Doctor of Nursing Practice Program. JEAN E. MONTGOMERY is a registered nurse formerly teaching in the associate degree nursing program at Austin Community College in Texas. She received her MSN from the University of Texas Health Science Center at San Antonio, Texas.